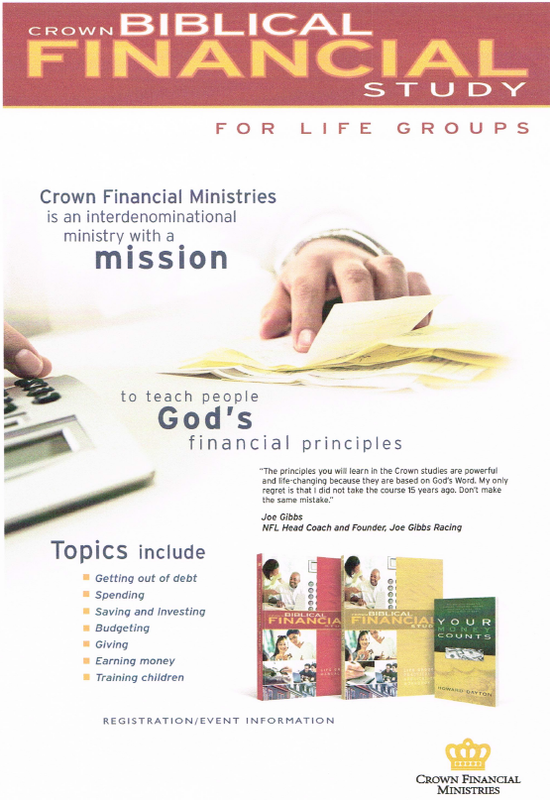 We are looking for people who want to learn more about what the bible has to say about money. Have you been trying to get out of debt? Are you not sure how to manage you money? Would you like to increase your savings? Then this is a very good 10 week study that is sure to help answer your questions and teach you. We plan on starting the Crown Study on Saturday, September 12th. We will do this for the next 10 Saturdays from 4:00pm-6:pm. This is a study that will require your full commitment. If you feel as though you can not make the commitment for this 10 week Crown study, please wait till we offer it again and save the limited space for others. If you know someone who could use some finical help, please print and share the attached flier with them. This too is open to all, friends and family are always welcomed to register. Please reply and register by Thursday, September 10, 5:00 pm.